and Matt Thomas of New/Era Sales, Inc. 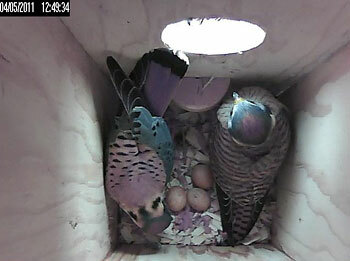 In early March, American Kestrels weren’t the only birds interested in our kestrel nestbox! Invasive European Starlings were also poking into the box to use as a potential nest site—even removing the wood shavings and filling it with their own nest material. Starlings are known for taking over kestrel boxes, and they are considered a pest species. On the evening of April 1st, 2014 - A female kestrel entered the box and found it already occupied by a starling! The resulting epic showdown was captured by our camera. Although it has been assumed that kestrels could evict starlings from a nest cavity, this is the first time it was actually recorded! In the end the kestrels won, and now there are five kestrel chicks in our nestbox.